FILE- In this July 6, 2018, file photo, a prospective customer confer with sales associate as a Model 3 sits on display in a Tesla showroom in the Cherry Creek Mall in Denver. 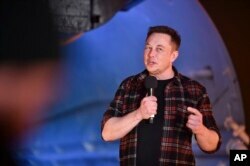 Musk has been under intense pressure to deliver on his promise of stabilizing production for the Model 3, which is seen crucial for easing a cash crunch and achieving long-term profitability. It said it was churning out almost 1,000 Model 3s daily, broadly in line with Musk's promises but slightly short of Wall Street expectations. The automaker's third-quarter pre-tax profit was around $3,200 per vehicle delivered, but for the first nine months of 2018 the company suffered a third-quarter loss per vehicle delivered of $8,019, according to Reuters calculations.